Not your usual Wood Ducks! Anyway the shots here are kind of cool I think. 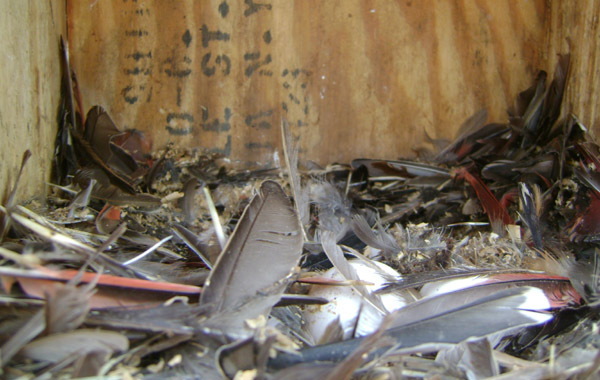 The top one shows a rufous and gray morph bird in the same box. Interestingly Brian noted a second nest box with owl eggs just a short distance away but with no occupants. There are reports of Eastern Screech Owls practicing polygamy so I wonder if this male maybe had a second female he was tending too? It seems unlikely that a second pair would be nesting quite so close to this territory to me but then again I am not an expert on owls by any means. 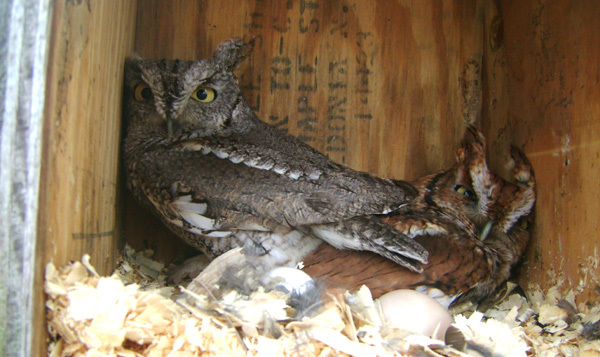 The picture above is of another nest box again replete with another gray morph Eastern Screech Owl. Instead of getting all agitated by the intrusion, I guess this bird has decided to go for the playing dead option? You can find out loads of info about owls at Owl Pages (website here) And there is even a forum that you can ask questions about owls on. 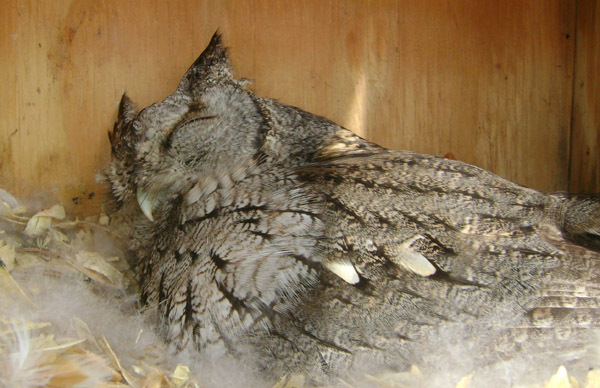 I recently went to an interesting and entertaining presentation at Braddock Bay Raptor Research given by Fred Sauter about how he enticed Eastern Screech Owls to nest in his backyard. BBRR currently has Fred’s plans for how to build a box up on their website (here). One of the things I found fascinating about Fred’s talk were the pellets that he brought in. It’s really amazing the variety of prey that they seem to take from insects, through crayfish and I have read about them taking birds as large as Bobwhite and Ruffed Grouse. This shot of the secondary nest that was taken near to where the shot with the two owls in shows just how significant birds can be in their diet, especially in migration. In the shot below I can see Northern Cardinal and American Robin feathers in there but am interested if anyone can recognize any of the others? Anyway thanks very much to Brian for sending me the email. It was interesting to hear from him about the owls and to hear about some of the history of the LPWA (which was initially apparently set up to fight the building of Ontario State Parkway) and some of the conservation programs that they are involved in today. These programs include improving the areas bird populations (primarily Wood Ducks, Hooded Mergansers, and obviously Eastern Screech Owls) and other conservation efforts like tree plantings, and Hunters Safety Classes. They currently manage 256 Wood Duck Nesting Boxes throughout Western New York, with approximately 130 in and around the Braddock Bay Wildlife Management Area, quite the undertaking!! !